In March Meikle lost his wonderful mother, Iris Gardner. Iris was a force of nature. There wasn’t any area of Iris’s life where she didn’t live life to the fullest extent. She and her husband of over 60 years, Kenneth (Ken) raised Mike, his sister and his 3 brothers in West Berlin, VT. Iris was an artist and craftsperson, expressing beauty through drawing, painting, sewing, cake decorating and many other activities. However, gardening and flowers were a true passion for her. Iris was instrumental in the establishment of Moonset Farm Floral and it was a great honor for Mike and me to create a “garden” for Iris’ services. Mike created the beautiful White Birch fence and arbor. Mike’s brother-in-law, Mike, crafted rustic window boxes which were filled with daffodils, tulips, hyacinths and other spring flowers. Our wonderful neighbor Nicki made the most incredibly detailed log fairy house, complete with a rocking chair, “stained glass window” and dream catcher. Because irises were her namesake flower I envisioned a multitude of the blue/purple Iris’s throughout the installation. It seemed like Iris was laughing down on me when I went to Boston to select the flowers. There were no irises! I searched every vendor, even going to Trader Joes. The only irises I was able to find were these beautiful dusty purple fancy bearded irises. It was then that I realized what I had to do. I created a beautiful garden gathering basket with those incredible irises to set on the garden bench. It was so fitting, and so Iris. With her clippers and gloves it was like she had just been in the garden gathering her namesake flowers. We miss you Iris and will think of you often. In March, Meikle lost his wonderful mother, Iris Gardner. Iris was a force of nature. There wasn’t any area of Iris’ life where she didn’t live life to the fullest extent. 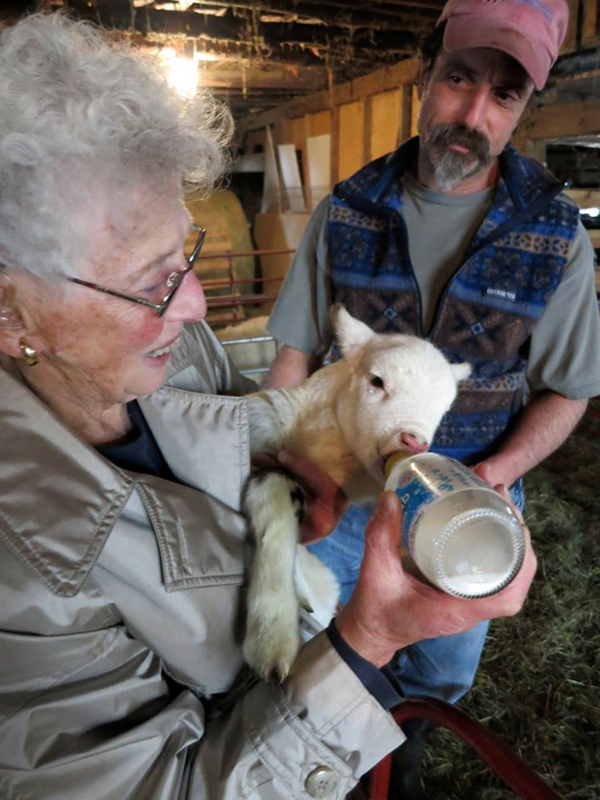 She and her husband of over 60 years, Kenneth (Ken), raised Mike, his sister and his 3 brothers in West Berlin, VT. Iris was an artist and craftsperson, expressing beauty through drawing, painting, sewing, cake decorating and many other activities. However, gardening and flowers were a true passion for her. Iris was instrumental in the establishment of Moonset Farm Floral and it was a great honor for Mike and I to create a “garden” for Iris’ services. Mike created the beautiful White Birch fence and arbor. Mike’s brother-in-law, Mike, crafted rustic window boxes which were filled with daffodils, tulips, hyacinths and other spring flowers. Our wonderful neighbor Nicki made the most incredibly detailed log fairy house, complete with a rocking chair, “stained glass window,” and dream catcher. Because of her name I envisioned a multitude of the blue/purple Iris’ throughout the installation. It seemed like Iris was laughing down on me when I went to Boston to select the flowers. There were no irises! I searched every vendor, even going to Trader Joes. The only irises I was able to find were these beautiful dusty purple fancy bearded irises. It was then that I realized what I had to do. I created a beautiful garden gathering basket with those incredible irises to set on the garden bench. It was so fitting, and so Iris. With her clippers and gloves it was like she had just been in the garden gathering her namesake flowers.